A lovely telescope, impressive size, impressive maker. But it gets even more interesting when you read the history of the possible owner, John Grant Gerrard, who rose to become a Lt Col in the 1st Bengal Fusiliers. Most notably he was at the siege of Jellallabad in 1841-2, and fought the battle with and defeated the Afghan Army of rebels under Akbar Khan, when on his way to Kabul, 60 miles to the west. He went on to serve in the Fusiliers in the Indian Mutiny, and was killed in a battle with the Jodhpur Legion near Delhi in November 1857. A detailed account of his life and a photo of his medals is given on http://www.britishmedals.us/collections/TB/heic/gerrard.html. In this 21st Century when the British Army is once again engaged in fighting Afghan rebels, it is interesting to note that there are still these links to the same fight 150 or more years ago. These extracts are taken from “The History of the Indian Mutiny”, by Rice-Holmes. How would the telescope have come back to the UK? J G Gerrard was born in 1808, in Calcutta in India, son of a Major John Gerrard of the 5th Bengal Native Infantry and his wife Harriet (nee Holt). (Presumably, therefore, his father was also a Captain Gerrard at some time previous to 1808). The son was educated in England – so presumably his parents were accustomed to making regular trips home – and then he became a cadet in the Bengal Light Infantry in 1826. When he died in India in 1857 he was aged 48: his wife was in India with him, I believe. 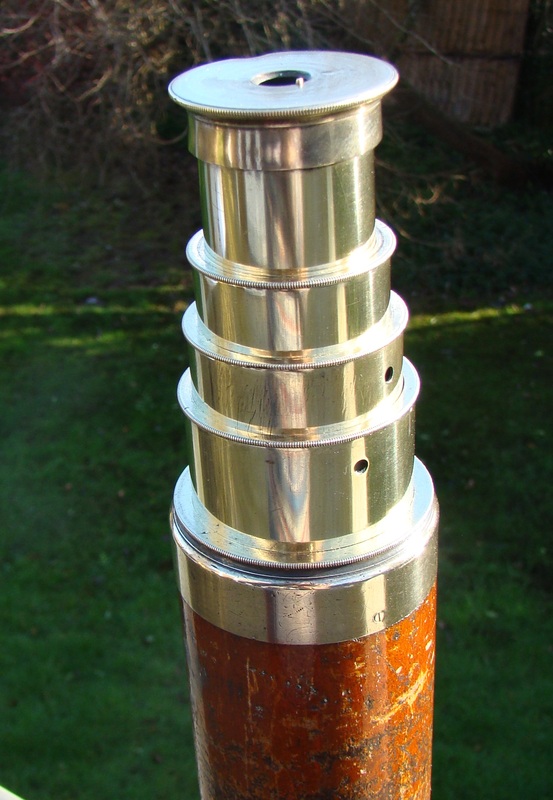 The telescope appeared on Ebay in 2011, and the seller was quoted to have bought it from a house clearance person in Jersey. So possibly Col Gerrard’s effects were returned to a family member in the UK, who maybe lived in Jersey? 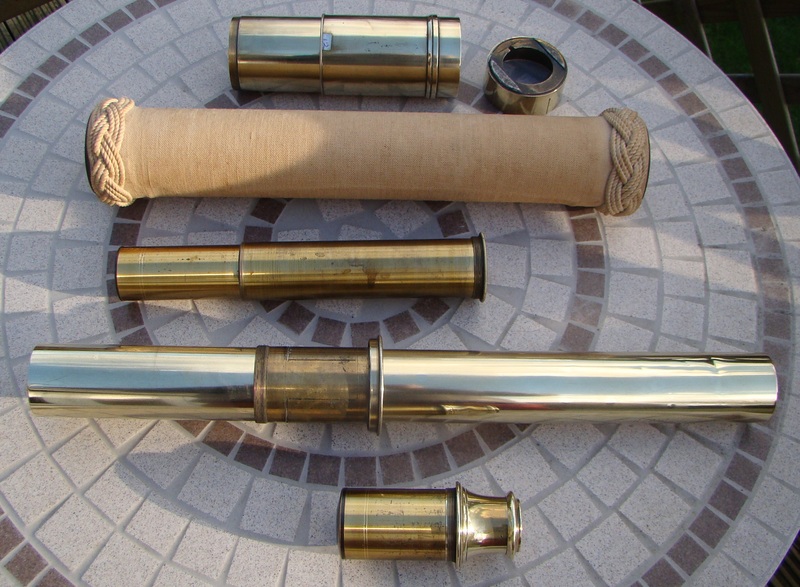 This telescope is very long when extended – it has four brass draws. Closed it is compact, 2.5” OD and 11.25” long. 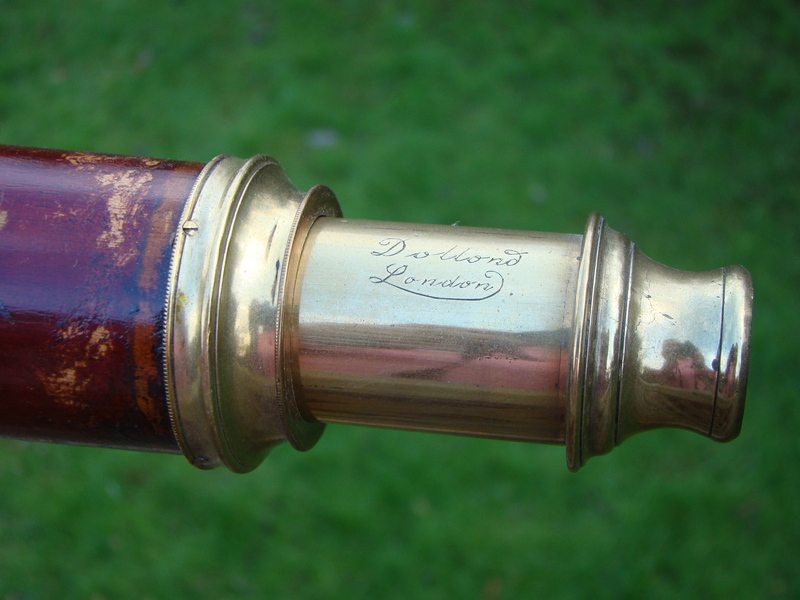 The mahogany barrel is 10.75” long, and has the brass end fittings screwed in place with the original recessed screws. 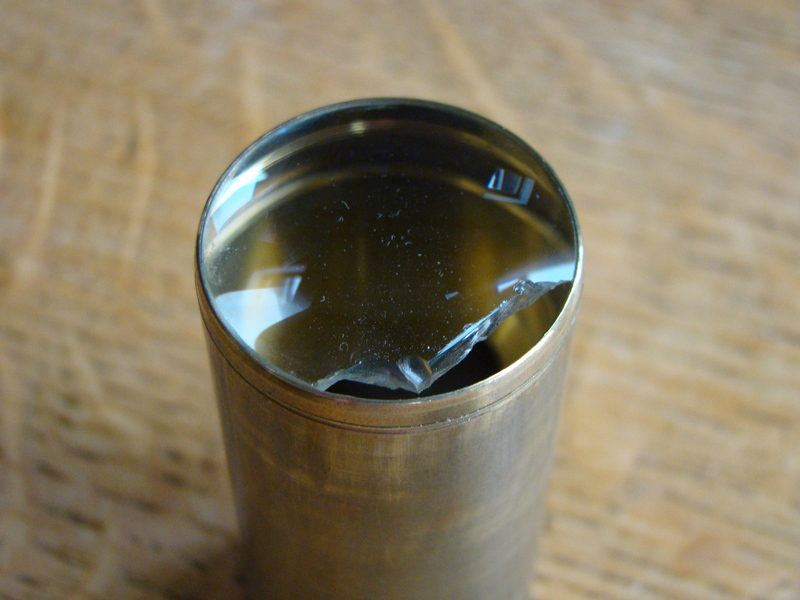 The eyepiece has a cover, and there must have been an end cap over the objective at some time, because the lens is vulnerable right at the end of the tube. This is missing. There was also no sunshade. 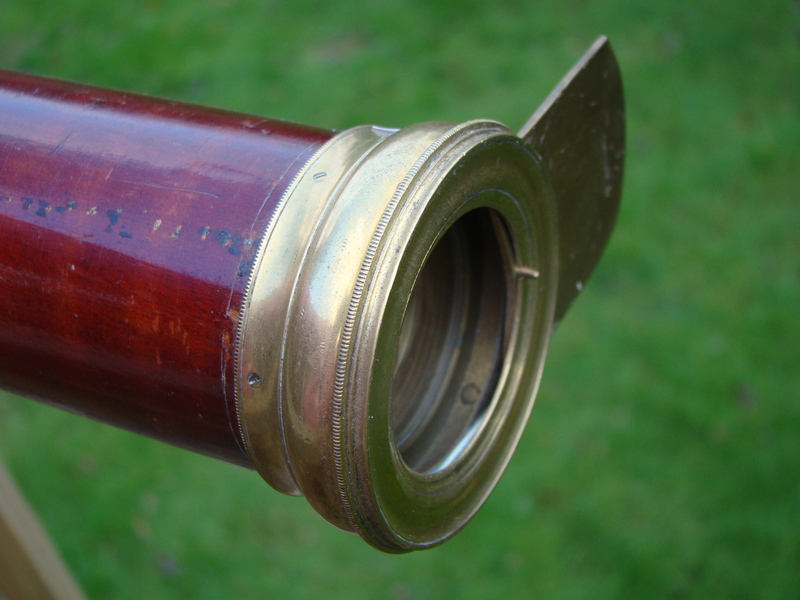 The edge of each draw and the eyepiece are knurled, and the eyepiece design is the pre-Victorian, ie Georgian flat design. Draws three and four have air holes (to relieve the air pressure on closing up) positioned near the knurled fitting end of the tubes. Fully extended the total length is a little over 42”. Magnification is better than average, as might be expected for this length, and the lens quality is good: the only problem is evident and visible when looking through, there is a rough edge on one side of the circle of the view: this can be attributed to damage visible on one edge of the second lens, ie the inner one of the eyepiece pair, which is broken away. There are several dents visible on the third and fourth draws, presumably from where the telescope has been balanced on something too solid, too fast! The varnish (and wood) on the wooden barrel is worn away similarly, both from hand holds and resting on support structures. The flat end of the eyepiece also has a dent. 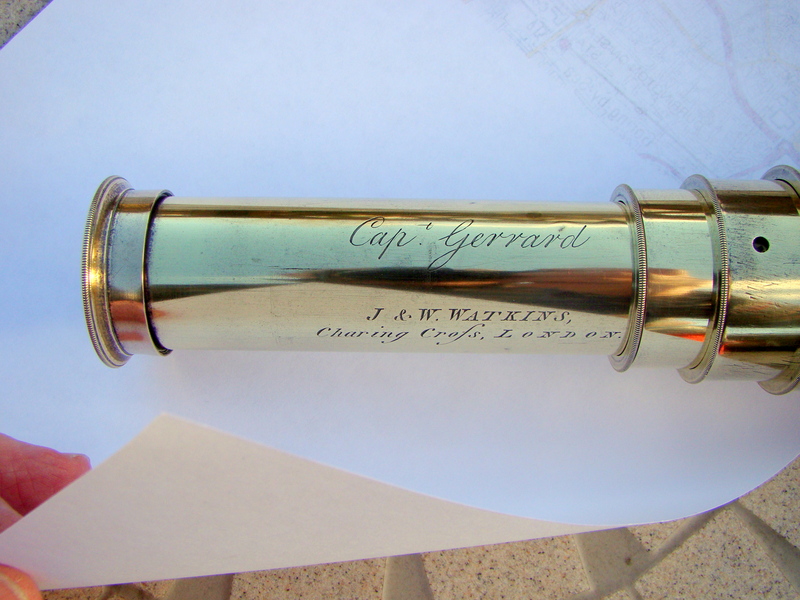 On the first draw, the telescope is engraved “J&W WATKINS – Charing Crofs, LONDON”, and above that “Capt Gerrard” in script, with the “t” of Capt in superscript. 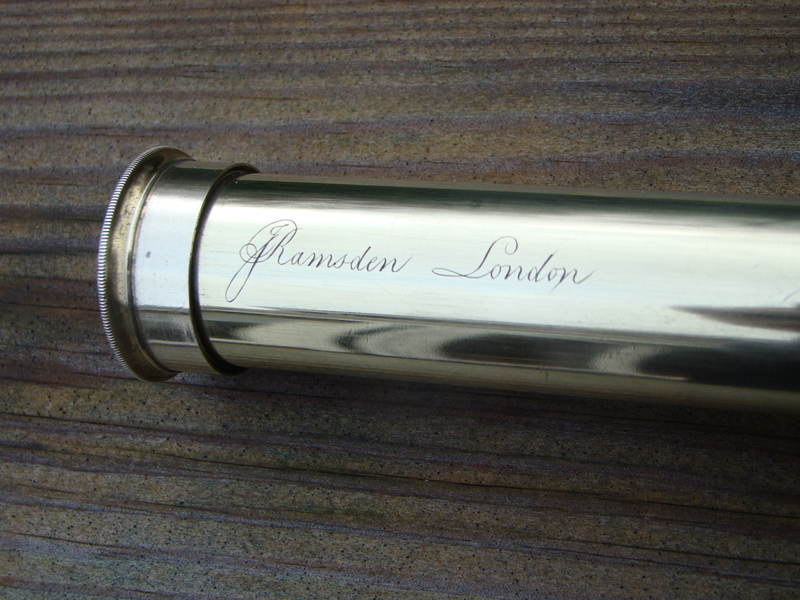 This is written the wrong way up, ie in use the engraving would be covered over by the right hand of the user: it has the J of J&W Watkins closest to the eyepiece. That, and the “f” (indicating a double “s”) in Charing Cross, both indicate a pre-1800 date of manufacture. As does the eyepiece design: but the four brass tubes themselves could look as though they had been manufactured in the early 1900s. This name also dates the telescope to the late 1700s. The initials stand for Jeremiah and Walter Watkins, who operated at 5 Charing Cross between 1784 and 1798. These were very accomplished instrument manufacturers, and worked by appointment to the Duke & Duchess of York, and the Duke of Clarence. Walter died in 1798. Jeremiah’s father (Francis) had run his instruments business at this address since 1747, and they took over from him in 1784: Francis had been associated with John Dollond, and took a share in his Patent for the achromatic lens doublet. So they were accomplished manufacturers. Jeremiah continued working there until he died in 1810. So a date of 1790 is fairly certain. Anyone buying the telescope new at that sort of time, for military use, would need to have been born in the 1770s at the latest – unless is was purchased (and engraved) second hand, later! It seems that the telescope was indeed designed as a high power spotting scope, such as would be useful in the mountains of Afghanistan. It was probably an Army telescope, rather than a naval one, because of the compact size when closed up, for easy transport on a horse. Note that the Officers did not worry about having bright metal parts on show, capable of flashing in the sunlight and giving away their position, in the same way as they wore bright red uniforms! Plus the rank on the first draw is “Capt”, which to me is more indicative of an Army rank, than a Naval one. Is this valid? But an Army function is fairly certain, probably for a cavalry officer to own, in those days. The telescope is fairly valuable just because it is in excellent working condition, and dates from 1790, and is made by J&W Watkins. So that puts it above £400. There have been many officers in the Army – as well as maybe the Navy – called Capt Gerrard, and we have no initials to make a more positive identification. A Google search finds J G Gerrard, but there is also a Capt Gerrard in the First World War, and in Ireland later, giving evidence in 1950 to an enquiry, and he even mentions another officer, a General Gerrard. But this telescope would have been engraved in the early 1800s, rather than the 1900s. [Just for amusement, Google also finds a lot of references to a Captain Gerrard who is/was a football player!] There is nothing to link J G Gerrard directly to this telescope – but he would have had one, for sure. With a positive link the value would double, at least. A future story will show how sometimes full documentary proof of such links is available – occasionally! But that proof goes back to only 1890. 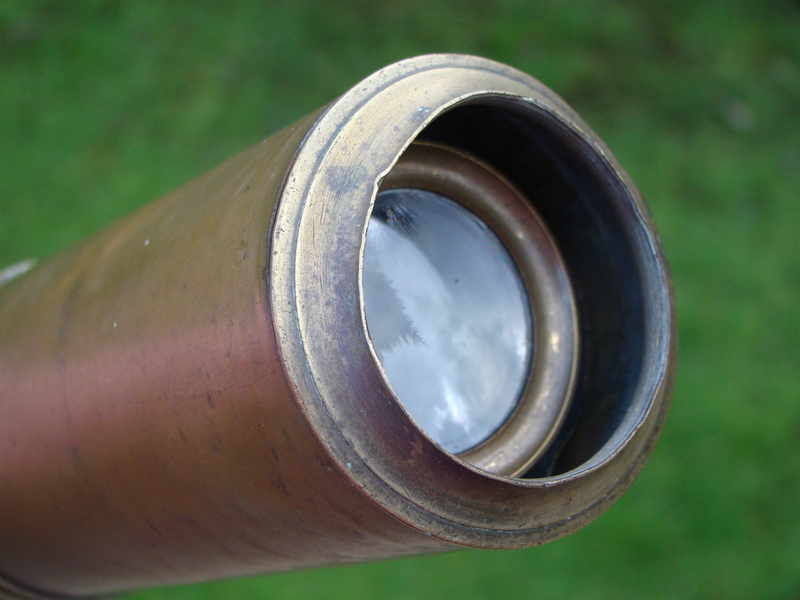 Already described, the Lt. Rolfe telescope engraving enabled tracing his history back to 1811, and the Peninsular Wars. At the time I valued that one at £350, maybe that was a bit mean! This does not “fit”, it is in fact a design leader, or one of two of them, ie alongside Jesse Ramsden (and maybe Berge). Whether they were both ahead of Dollond in the design of metal tube multi-draw Army telescopes is not known, as early Dollond telescopes of this style cannot easily be dated between the 1790 period and the 1840s, because Dollond did not change their name in that period. There could be earlier dated Dollonds, identified by having the flat eyepiece and the engraving this original way up on the first draw. But the ones I have seen have not necessarily been multi-draw types, I need to look at some samples. I maybe should read the Dollond history book again. The forces war records website finds another Captain Gerrard, this time called Thomas Gerrard, who suffered a major wound while fighting for the 23rd Light Dragoons at the Battle of Waterloo, in 1815. There is then another Thomas Gerrard who flew Sopwith Camels in WW1, becoming a Flight Lieutenant and a Flight Commander: he was the son of Brigadier General E. L. Gerrard DSO, according to Wikipedia. Presumably the Brigadier had at some time been a Captain too! 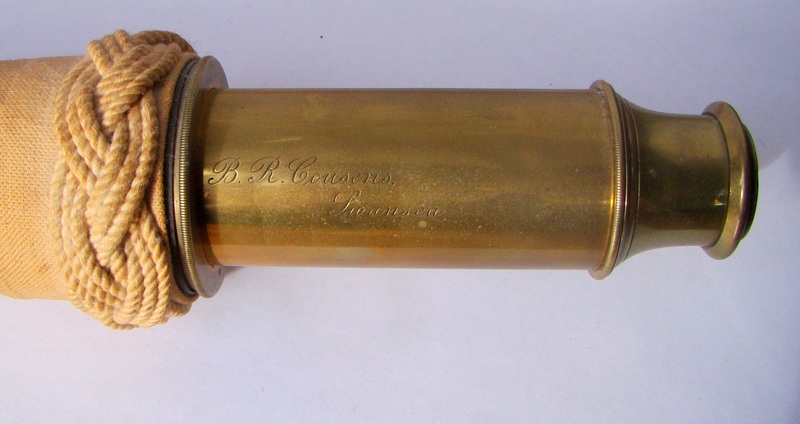 It seems likely that the best candidate found so far for having purchased this telescope new, in the 1790s, at the time holding the rank of Captain, could have been JG Gerrard’s father…..? The defence of Jellalabad made heroes of the 13th Foot (later known as the Somerset Light Infantry). It is reported that as the regiment marched back through India to return to Britain every garrison fired a ten gun salute in its honour. Queen Victoria directed that the regiment be made Light Infantry, carry the additional title of “Prince Albert’s Own” and wear a badge depicting the walls of the town with the word “Jellalabad”. The army barracks in Taunton, the county town of Somerset, was named Jellalabad Barracks after the battle and that area of the town is still known as ‘Jellalabad’. While this is titled as a “Ceremonial” telescope, I have nothing that gives official justification to the description, it is just that I cannot see how anyone could actually use this in practice, without a significant weight lifting qualification. Although I guess an Admiral could call for a sailor whose shoulder might act as a telescope rest, or alternatively he could find a window on the bridge that might open at the right height. 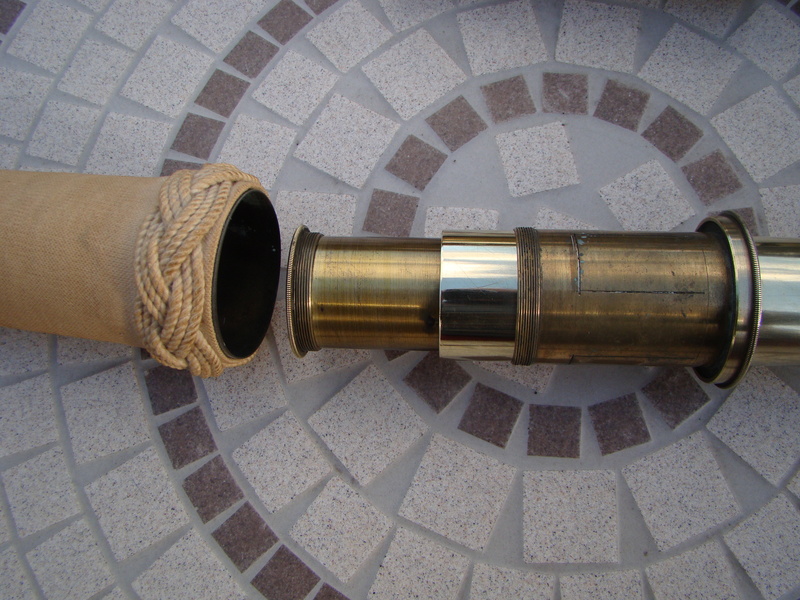 The telescope is described as Ceremonial because it looks the part, being large, with shiny brass and canvas covering, decorated with a typical sailor’s teased out knotting at each end. If anyone knows what the knot work is called, ie like ‘Turk’s Head’ or similar, please let me know! A friend, who is a retired Rear Admiral, David Coppock, suggested that it was the typical badge of office of the First Leftenant on board ship, who was sometimes called a Jimmy! The telescope was found in the ‘Indoor Antiques Market’ in Basingstoke in December 1993. The owner was said to be an antique collector, who priced this at £155, but after some negotiations it was sold to me in February 1994 for £135: it was the twelfth telescope in the collection. The owner, codenamed “Annie”, was trying to raise cash for the garden centre business she had set up. The Swansea library was very helpful. The telescope is engraved “B.R.Cousens, Swansea”, so they advised that Basil Rayson Cousens was listed in a directory for 1889-90 as a “nautical instrument maker” of 20 Wind Street, with a residence at 25 Terrace Road. He also made watches and chronometers. In the 1895 directory the entry is under Mrs Basil Cousens at 20 Wind Street, and the subsequent 1901 directory does not list anyone trading. The red brick building, apparently, is 20 Wind Street today! Next to “The Bucket List”! 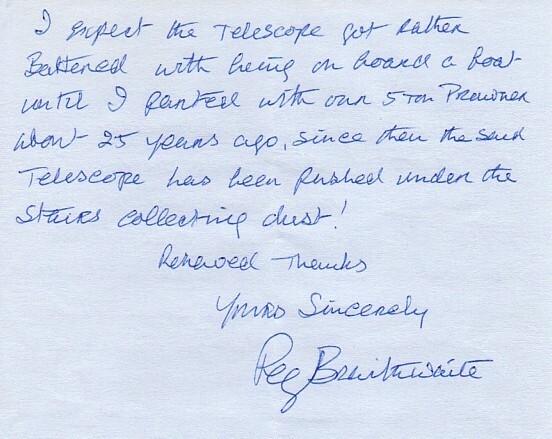 The seller of the telescope did also reply to my enquiry as to its history. It had belonged in her husband’s family. Around 4 years before, his father had died, and passed on the telescope, but it had in fact belonged to his father, presumably who had been born 1880-90, so was possibly not the first owner. His surname would have been Curtis. The telescope certainly saw naval service in WW1 and maybe the earlier Second Boer War. 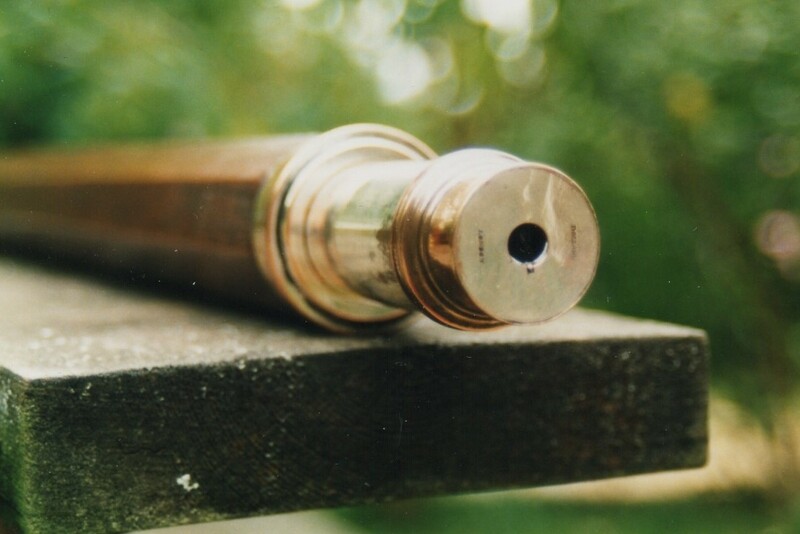 So the telescope is a Victorian single draw brass model, but is missing the slider in the objective end cap. The sun shade is 2.5” diameter, the objective assembly 4.5” long, the canvas main body is 15” long, and the single draw gives a fully open length of 39.5”. Closed it is 21.25”. The design looks Victorian, with the eyepiece the Victorian shape, plus it is also built as solid as a battleship, like the late Victorians might do it, because they could. This is reflected in the weight of the construction, altogether around 2kg. 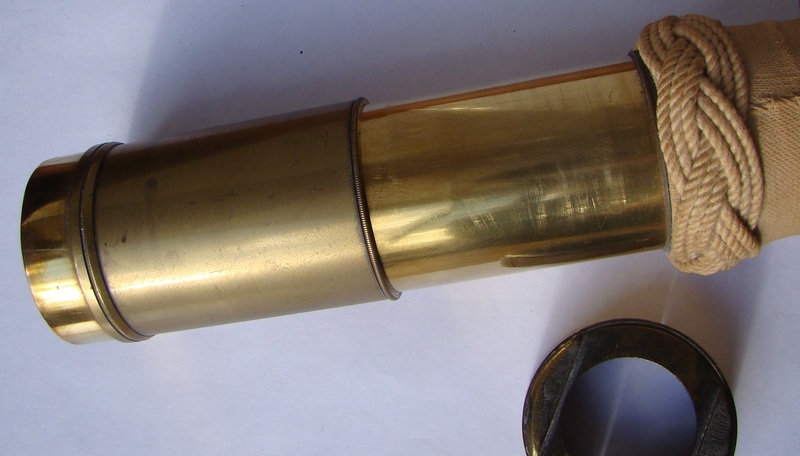 The photos also show the amount of brass within the brass body, particularly to support the second double lens assembly, to be in the right place in the middle of the first tube. The photos hopefully show this. Also significant is the air hole, allowing the air to be expelled when the telescope is closed down. It is positioned close to the objective lens, underneath the covering offered by the sun shade. So the telescope is not easily supported, using one extended arm, for very long! Obviously Victorian, solidly built for show, for naval high-ranking personnel, but probably rarely used, and then on a stand or support on the bridge of a metal built ship, WW1 and later. Then quickly retired to a shore base, and used for “show”. Not really sure, because I’m biased, I would prefer to use them rather than show them off. So factor that in, plus that it is built very solidly, and works quite well, then it might be worth £400. But I would not buy one like this again! Although I have had this one for 20 years already. Accession number 12. The Dolland, not fully extended, showing the two draws and the apparent rusting of the second draw. I found this telescope in a ‘second-hand’ shop in Rawlinson Street in Barrow-in Furness, Cumbria in November 1993. Perhaps that is a long way to go to look for such things, but at the time my mother-in-law lived in Barrow, and so this provided an interesting diversion during the weekend visit. All that could be seen was that it was a large, 2.5” diameter telescope with two brass draws and an oak wooden body, plus a sunshade. The whole thing was black, really dirty (corroded), but you could see part of the name Dolland on the first draw. At the time I did not know that there was a difference between Dollond and Dolland. The Dolland telescope objective, showing the reduced diameter of the actual lens compared to the overall external diameter. The last thread is maybe for a lens cover (missing). The shop owner said he had bought the telescope with some items purchased from the Walney Island lighthouse, but that it did not work, so he only wanted £20. This seemed like a reasonable price to start off a major renovation task, so I bought it. Taking it to pieces, in order to scrub the dirt off, it became apparent that there was an extra objective lens screwed into threads on the outer rim of the sunshade: someone had found a lens from a later binocular or similar and screwed it in. Straight away removing this sorted out why the telescope did not work: without this extra added lens it worked fine! The threads in the end of the sunshade are presumably where originally there would have been a cover over the objective lens, to protect it, of a similar design to the cover over the eyepiece lens. Then, after a lot of scrubbing, washing, then brass polish, a telescope emerged! Total length of the telescope is 31.75” extended. Frankly, it’s pretty poor. It is a conventional 5 lens system, with a dual element objective, but the 2.5” OD actually hides a 1.375” optical diameter objective. All the tubes used for the draws, sunshade etc, are very light gauge, and not strong, so that they are significantly dented from normal use. Certainly the second, larger draw is a poorly brass coated (or plated?) steel tube. The joints, made up of screw threads, are too short compared to a Dollond, so that they easily pull out or become stressed and fall apart. The telescope is not built for long term use, it suffers easily with the normal wear and tear of typical use. Someone has tried to sort this out in the past, by adding solder to the threads to reinforce them, and maybe provide more of a grip between the sides of each joint. The eyepiece lens has a cover, which sticks out of the side of the round eyepiece when it allows you to look through it: unfortunately then the bit of brass that sticks out can get in the way of your nose, or your forehead! Not a particularly good design feature. With wear also, this cover falls back over the lens under gravity, which is not an aid to easy use. 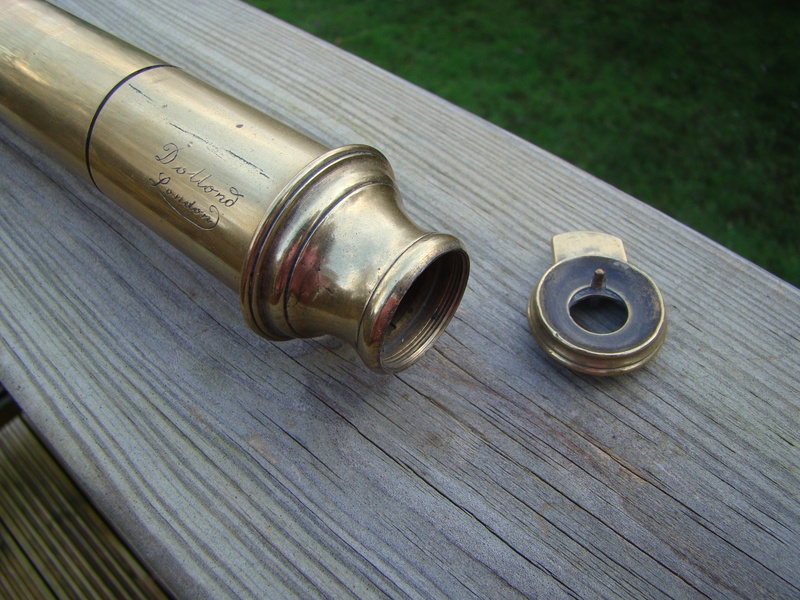 The basic design is what I would call early Victorian, given the bell shape of the eyepiece. On the first draw, the name “DOLLAND” is visible, but wearing away, also with the word “LONDON”. I suppose with light gauge tubing they could not engrave very deeply. Interestingly, inside the tubes, the joints are labelled VIII, which implies they were individually sized and fitted, sometimes a mark of a quality piece, sometimes showing their machining was pretty bad and they had to choose units that fitted together. Through contacts in the Dollond and Aitchison management, via my boss’s brother-in-law, I eventually asked about the use of the name Dolland. The comment was that the name was used by an American copy of the Dollond telescope, at the end of the 1700s and early 1800s. But this one has been labelled as from London, which would have been incorrect. Maybe it was to get round the Patent on the objective lens, but more likely it was just to trade on the ‘Dollond – London’ name, and create an impression of quality. What later transpired was that the name Dolland appeared to be adopted by many makers, often UK based, who used the Dollond patented dual lens objective, after the expiration of the Patent. Unfortunately, while their telescopes worked, they were generally not quite of the same quality. I could have claimed that this was maybe the first documented case of Americans treating English spelling with disrespect: maybe more likely it was originally American businessmen trying to make a fast Buck on the back of British quality product reputation, and maybe marketing, something continued later by Japan and then China! For me the link to D&A resulted in an interesting visit to their Museum in Birmingham, which was reported here separately. On the TV news, even in the southern part of the UK, on 26 Jan 1994, it was announced that the Walney Lighthouse keeper of 50 years, Peggy Braithwaite, MBE, was to retire. Peggy was the only female lighthouse keeper in the UK, ever. She was born on Piel Island in 1919, and first went to the Walney lighthouse in the 1930s, when her father was assistant keeper. The job was kept in the family, with her brother-in-law and her sister also working as assistant keeper. For many years Mrs Braithwaite (nee Swarbrick) was assistant keeper and was made principal keeper in 1975. So what do you do? 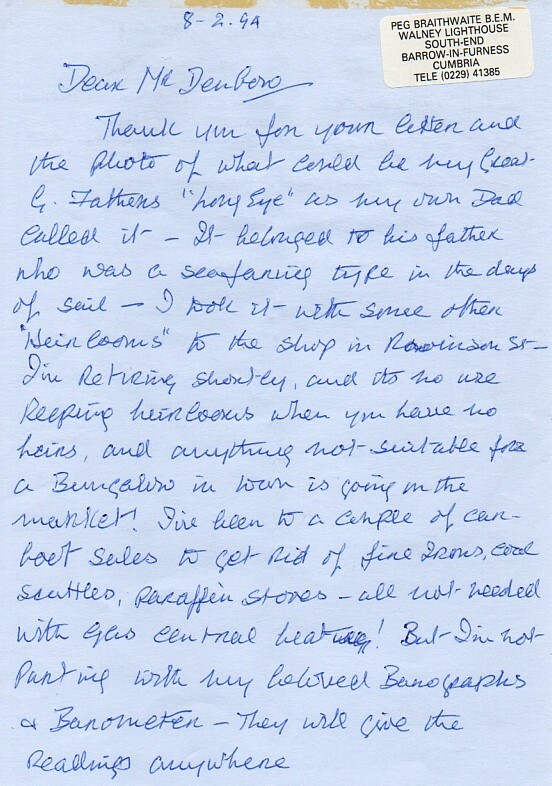 Well I wrote to Peggy, c/o the lighthouse, to ask about the telescope I had bought in Barrow. Peggy kindly took the time to respond, as you see on the copy here. 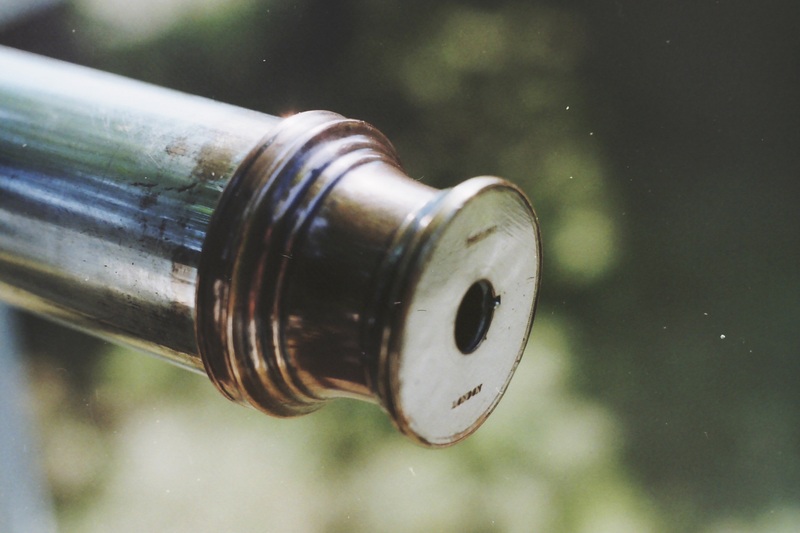 She calls the telescope her Great Grandfather’s “Lazy eye”: which had been used by her Grandfather, who had been a seafaring type, in the days of sail. If Peggy’s father was born in 1900, and her Grandfather therefore in 1880, this would maybe be the time her Great Grandfather would have been using the telescope? Assuming he bought it new. This might be right, looking at the fashions of the late Victorian scope………. 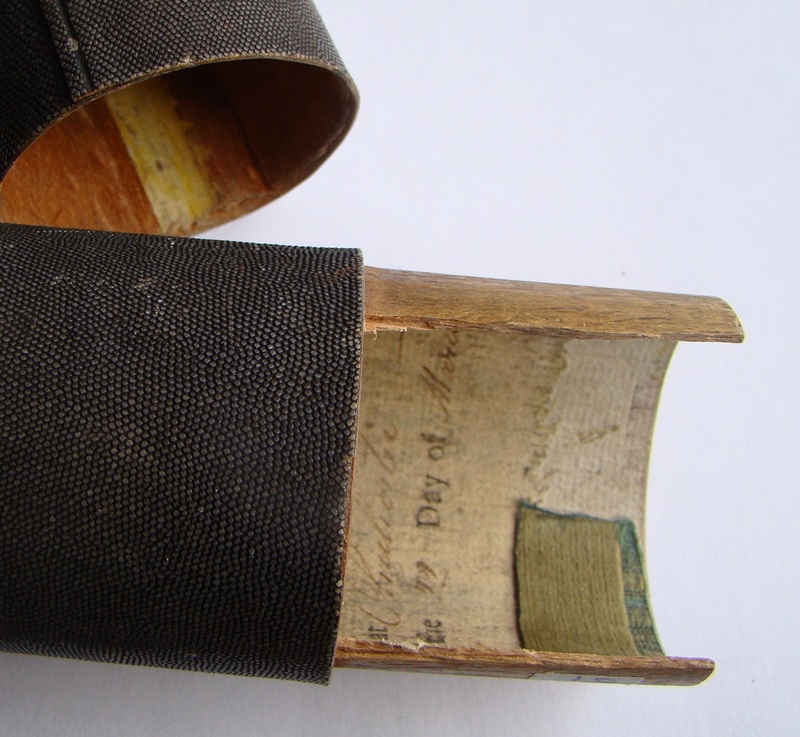 it’s a Victorian looking eyepiece, but maybe early Victorian, rather than later on. Being quite large, this telescope was intended for shipboard use, on Victorian sailing ships heading to the Far East maybe. Certainly from what Peggy says in her letter, it spent many of its latter years on the waters round the Irish Sea, Barrow and Walney island in her 50 foot yacht, which is maybe what she described as her prawner. 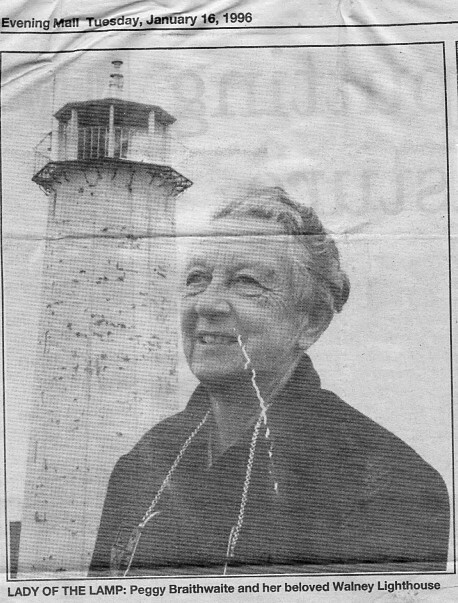 I don’t know if Peggy wrote the book about Walney lighthouse that she was planning, as she died in January 1996: the photo of her is from the local paper at that time. Hopefully her Great Grandfather’s telescope will live on with this account, as she has no direct descendants. For a picture of the whole thing, fully extended, see the photo of the 8-sided Dollond telescope. With this pedigree, it is worth more than the average Dolland, so maybe £150-200. This was only the tenth telescope in my collection, acquired early 1994. This Dollond telescope is of a type of design that I honestly thought I would never be able to own, or afford if the opportunity arose. I believe that it is said that the 8-sided design was introduced to create flat sides, so that the telescope would not roll around on a ship, and fall on the floor etc. This was in the late 1700s, when ships were made from wood, and every ship had at least one crew member who was a carpenter, and plenty more crew who were accustomed to sorting out and fixing wooden planks! So it defies belief that any ship’s deck would not have been equipped with wooden retaining slots, hooks or pegs that allowed a telescope to be secured, not just from rolling but also from being thrown into the air! This is not to say the flat sides of an 8-sided telescope do not provide a more secure surface to place the scope safely on a table: this is useful. But the main body, or the barrel of the telescope is not what normally touches a large flat surface, the metal rings at either end are larger in diameter than the flat faces, so it is on these round rigs that the scope sits, when you put it down on a table. So it still rolls! To put it down safely on end has to be hanging off the edge of the table – which introduces the hazard of being knocked off by passers-by. Some of the collection in August 95. The paving slabs are 2 feet wide.The sunshade on the 8-sided Dollond can be seen to have lost a lot of the silver plating: as have the rings at either end of the main barrel. 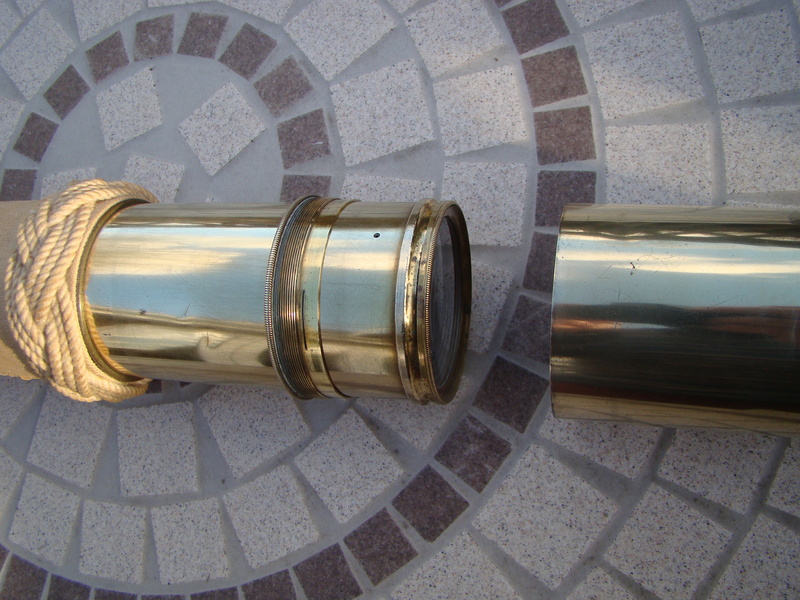 Below is a brass bodied Cousens of Swansea scope and a Dolland scope from Walney Island, of which more later. 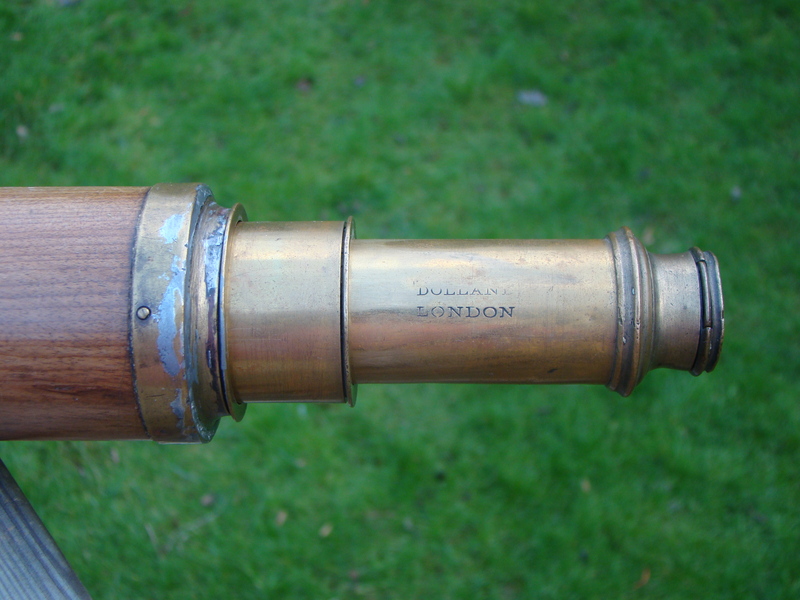 The reason Peter Dollond built this style of telescope for his naval captain customers I think is the same reason that this is the one I have preferred to use every time I want to identify a passing aeroplane, for the last 20 years. It gives a good magnification, with a relatively wide angle of view (for a telescope). But, as it is nearly 4 feet long to achieve this magnification, many alternate designs built at that time would have had to use a relatively more solid wooden barrel, and this becomes heavy to use. Probably with an eye at one end, you are not comfortable if required to support a heavy weight from a pivot point (hand hold) about 2 feet down the tube, unless you have an extra long left arm. This telescope is constructed from what might be described as flattened C-sections of mahogany, making up the barrel, in the same way as a split cane fishing rod was designed as the lightest rod that could provide strength, for fly-fishing. So the result is a very light weight and easy to handle tube, which can support the heavy weight of the objective lenses and sun shade mounted on the end, without warping. This makes it very easy to use (for me) pointing up in the air looking for aeroplanes, where you rarely have a support pole to work alongside. But on a ship, you might be on a rocking deck, with the support structures attached to the hull being buffeted by waves: much better to have a scope you can hold freely and without effort, to counter the wave action. Significantly, no telescopes after this date really solved this problem, except for the tapered wooden barrelled versions made in the early 1800s. Actually, 8-sided scopes are not rare: there are models sold regularly. But these tend to be 12-24 inches long, and are made from a solid wooden tube, planed into eight flat sides: why I am not sure, maybe it was the fashion. There are very few 8-sided scopes around made from eight separate bits of wood. This is probably because they are subject to damage, the wooden pieces split apart or break when dropped. They are not strong enough to hold the objective lens construction really, and this pulls off. This has happened to me, with this telescope: an accident broke off the objective. What would a ship’s captain do? He would give it to the carpenter. Actually, its an easy job to shorten the tube by 1cm, file it down to be round to take the ring that holds the objective, make some new screw holes, and its complete. And the focus – well the eyepiece tube just has to be pulled out by an extra 1cm, it’s a built in next generation feature. A slight design criticism, or frailty, is that the objective lens screwed on to the far end is very vulnerable to being knocked against things, and when the telescope is 4 feet long I guess the end can fall off overboard! So maybe that explains why there are few complete units around: bits of them fell off ships. Another problem is that they are very long: for many years this one lived on two brass hooks above the dining room door, so that I could grab it on my way to the back door to go outside and catch a passing aeroplane. The inevitable accident was that it fell off the hooks one day. Now it is fitted with two cable ties, which have secondary ties in a loop over two different hooks in the ceiling rafters just inside the patio door: a new exit for me to catch the passing aeroplanes. It is also well away from passing children and Hoovers. This unit, apart from the wooden barrel, was designed and produced as a single draw made from brass, plated with silver. 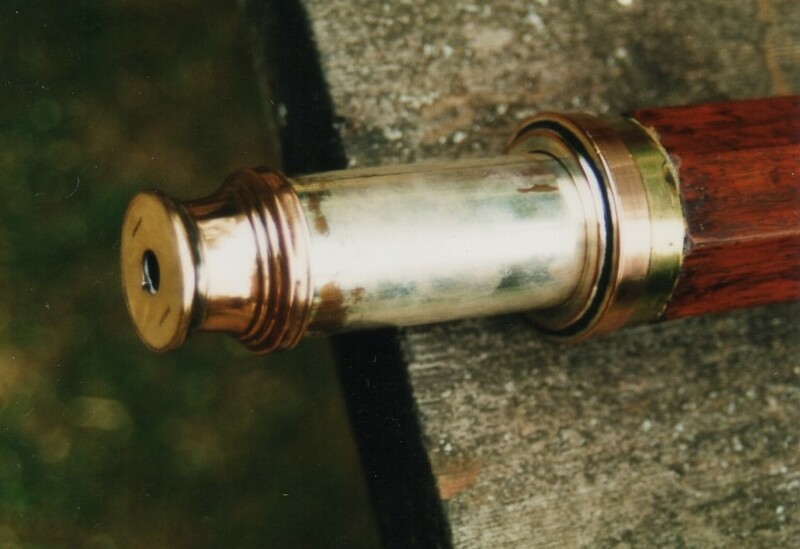 The fittings on the end are both of copper and brass, typically the rings I think are copper, and were also silver plated, when the scope was built. When I bought it in 1995, the sunshade was badly bashed about, and with not much silver plate left. 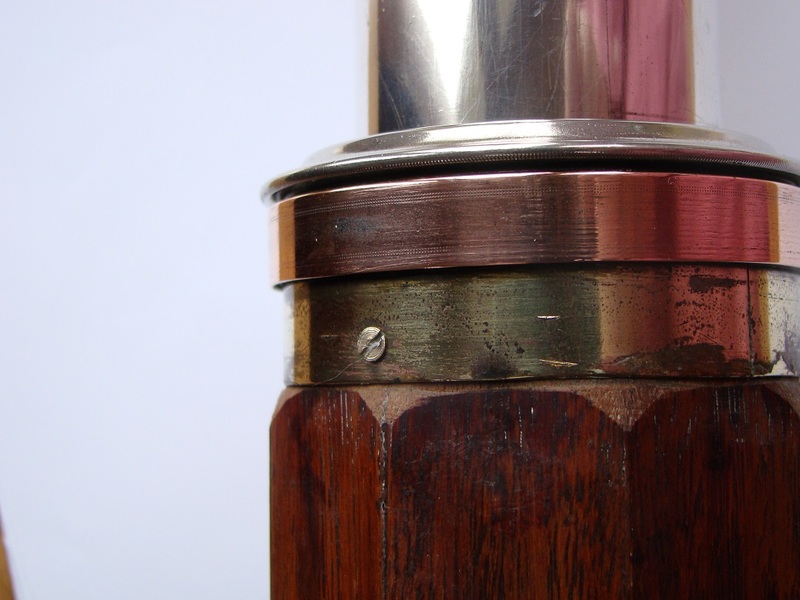 Similarly both of the connection rings to the wooden section were lacking silver plate, as was the eyepiece finger hold, which presumably from the wear of fingers over the years, was reduced to brass. The mixed brass and copper connection rings, with the plating worn away. The option available to me was to recover the most damaged/unplated parts by bright nickel plating, which I organised. 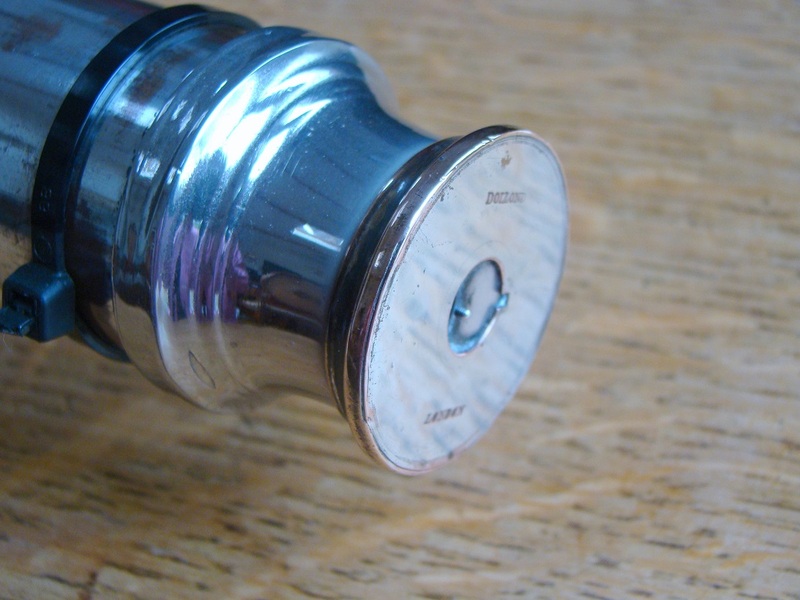 The silver plated draw tube and the very end of the scope at the eyepiece were left as originally silver plated. 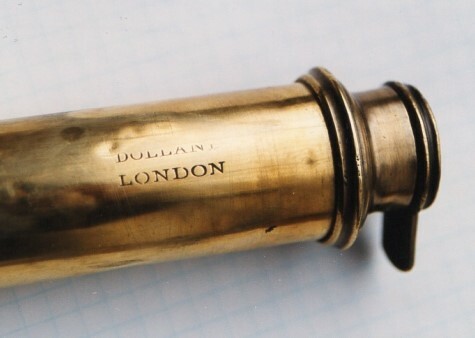 The draw tube shows some wearing away of the plating at the finger pressure points: the end plate on the eyepiece bears the stamped name of “DOLLOND”, with “LONDON” in italics, ie it pre-dates when they engraved on the first draw. I guess they only had to buy stamps for those three letters too. The guys doing the stripping and plating of the sunshade commented that they had a lot (!) of trouble removing the original plating off the copper/brass. So the 18th Century platers had done a good job really! The connection rings onto the wooden barrel have been left as found, ie with plating worn off, and therefore shown as brass and copper. 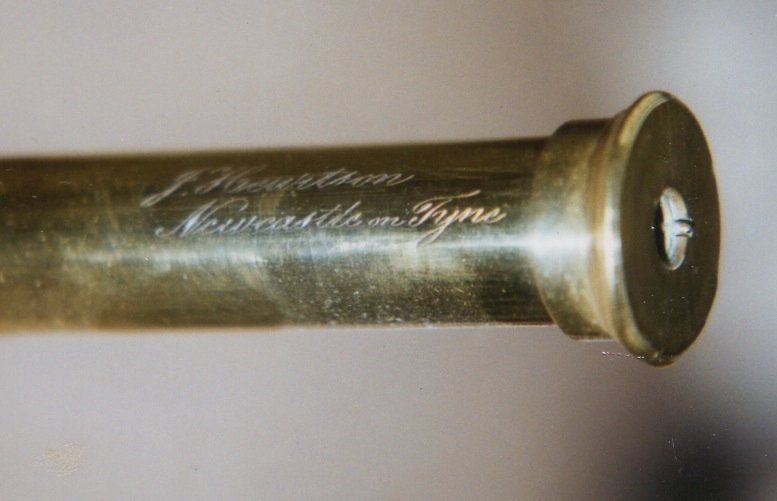 The eyepiece of the Dollond 8-sided scope when purchased in 1995: the maker’s name is engraved on the end face. Silver plating has worn away from the finger pressure points on the first draw, and almost completely away from the cast eyepiece housing. 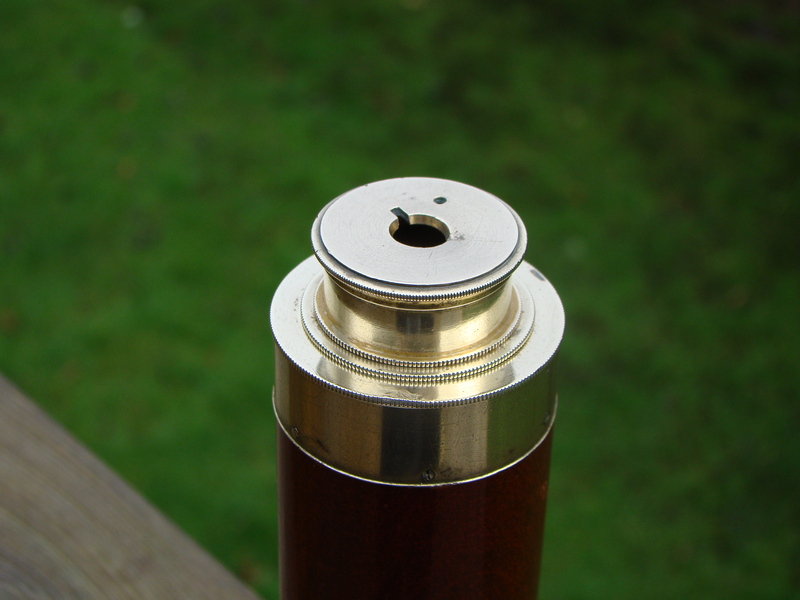 The effect of re-plating of the eyepiece can then be seen in the next photo, where the flat end, which unscrews, is left as was, and the copper rim can still be seen around the edge, but the bell section is re-plated. The black cable tie is used to hang it securely on hooks in the ceiling. 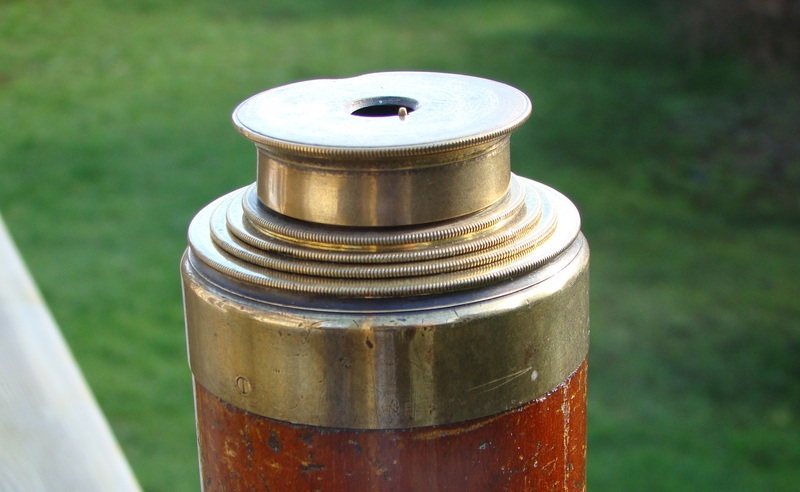 The whole objective end of the telescope is fitted to the wooden barrel using one of these connection rings, on a press fit which is not that secure: how this was originally secured is unknown. I would just not poke the end over the side of a ship, or a high building, it’s just not worth the risk! Objective end OD is 2.375”, with the closer connection ring 2.5”. Flat to flat dimension max on the barrel is 2.25”. Total length fully extended 51”, focussed length around 45”. So, its pre-1995, and you have attended the annual London Scientific Instruments Fairs, looked in all the local antique shops: then actually you have to take some products to a photographer for PR shots, and in talking to him he mentions that he had used a telescope in a recent photoshoot, but he had a real problem getting hold of one. Eventually he had been told to go to a “Compass Adjuster” in Hamble, called R. W. Robinson, and he had loaned one. So you learn that Robinson has a shop, and as a sideline to compass adjusting on oil tankers, he sells antique nautical instruments, like telescopes, and other things. One summer your aunt visits from the USA, and in finding somewhere to take her for the day you happen to pass by Hamble, and call in on the way to the riverside pub. Mr Robinson had this fairly beat up 8-sided telescope – it looks like it’s just come in – so I think to myself, “It will be about £350, or even more: I think I’m going to have to push the boat out to get this one”. Obviously I did not look too interested, because he only asked for £200, which I ‘reluctantly’ paid. I then skipped all the way to the pub: Aunt Hilary did me a real favour! What’s it worth now? Well obviously I rate it highly, but I have not seen one for sale since 1995: it’s probably worth about £1000: but it’s just not one that I would ever sell. I can just relate to it. Where/when does it fit in? This is obviously a naval scope, for use where there is space on deck, and where the light body and magnification were useful, like Royal Navy ships, on the bridge, or for the Masters of East Indiamen I guess. It pre-dates the telescopes of around 1800, but because it uses the Dollond patented dual element objective it must be after say 1760. So a reasonable estimate is 1760-1780, around 240 years ago. The fascination for me is that it works as well as it did when it was made in the late 1700s, after nearly 250 years, for me to spot and watch the aeroplanes flying over my house now, that were could not even have been conceived of at that time. They were looking for sails on the skyline, or hazardous rocks no-one had seen before – and maybe birds in the sky, or the moons of Saturn. But what else did the previous owners see through there, and where has it travelled to? There are no clues to that, no names stamped on the body or the wood. It is actually perfectly balanced to enable the long body to be held up in the air, fairly stable, to find and observe an aeroplane. It has a good field of view and a good magnification. So that is what it has spent the last 20 years doing! Accession number 25 in my lists, bought in June 1995. June 2016: Heavy use for the last 20 years has stressed the joint between the objective assembly metalwork and the mounting ring onto the wooden barrel. The soldered joint between the tube behind the sunshade and this ring has failed, and the actual joint overlap is only a couple of mm. So it is dangerous to point the telescope into the air! It has gone away for re-assessment. Oct 2016: the scope is back in use, mounted on hooks over the door so it can be grabbed on the way out into the garden. The end joint between the mounting ring and the tube leading to the objective lens is resoldered, with help from a colleague in Lancashire, so it is solid once more. A light polish has brought back the shine too.